I sold my mid-2012 macbook air and bought the 12.2 and I am thrilled with my decision. For my uses, this gorgeous tab is a genuine laptop replacement. As a writer, I used it for the first time over the weekend with Hancom Word. I used an inexpensive, temporary bluetooth keyboard from Amazon. It all went perfectly, even through the printing process on my wifi Brother laser (using the Brother app)and emailing it to myself for later use on my mac desktop. It went easier and faster than if I had done it on the Macbook, plus I had the great tablet abilities that the mac didn't have. Moreover, my Ipads (all sold a while back) could never have done this. The 12.2 is a wonder! I hope hancom is soon available for my SN10.1 2014 edition. jtowndawg, geekaren and btrotta like this. Wecome to the forums and glad you like the new tablet! I write a lot, too, I take notes, write bids and invoices, make purchases, edit files and what not and it used to be a royal pain to get anything done with Apple since I kept having to go back and forth between iPad and macbook. This tablet has no equal. I totally agree. I just need to get the new samsung s mouse and a better bluetooth keyboard hopefully with shortcuts for the 12.2. The only thing that keeps me from using it as my primary device is the fact that I cannot save and/or edit from the cloud. I've tried Google Drive, Dropbox, One Drive, Box and others and it doesn't work with any of them. I prefer not to save everything directly on my Note Pro. Has anyone figured out a way to get around this problem? As an example, if I have a document that I need to edit stored on one of these cloud based services, I can download and edit that file. 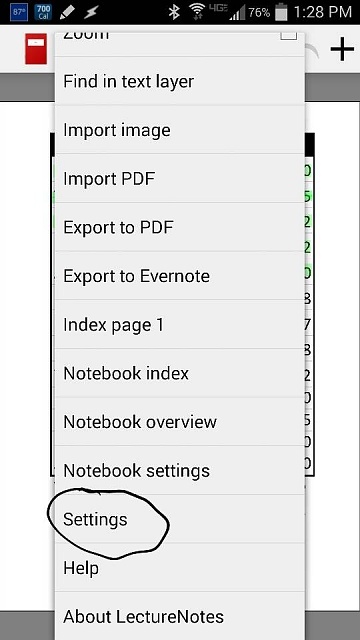 When I attempt to save my work, it defaults to saving the updated document on my Note Pro, not it place of origin in the cloud. That means, I will essentially have two versions floating around, the first is the original version in the cloud and the other is the updated version on my Note Pro. I can easily sync a local file with a cloud folder/file on my laptop, but there doesn't appear to be a way to do this with the Note Pro. I've even tried online editing in a browser with Google Docs and Office 365, but those methods don't seem to work either. For my needs, it's just not quite there. With office files saved to Google Drive I find that Hancom does not have write access to the Drive folder so although I'm able to open a spreadsheet that is stored on Drive in HCell for example I'm unable to save it and must instead make a copy as you say. Hancom doesn't support sharing so that has to be done manually using a file manager application. Needless to say dealing with multiple copies every time one wants to edit is a deal breaker so Drive is out for me in terms of working mobile using the Note and Hancom. Dropbox on the other hand works fine for me. If I'm in the Dropbox application and I invoke an edit session from there by tapping a Word or Excel document the Dropbox application will launch Hancom for me and I'm able to make edits, click the save button and those edits are synced to Dropbox for my other devices to see. The only issue with Hancom that I have with regards to Dropbox is that there's no support for it within Hancom itself which means that in order to create content that I intend to work on within Dropbox I must first save it to My Documents (or anywhere else on my device) and then use a file manager to Share it to Dropbox. I then delete the local copy and open the cloud stored one from within the Dropbox application. Its cumbersome but it works. I'll just add that the file creation issue can be fixed by installing Dropsync and setting up a sync between any folder you wish to work in on your device's internal storage and a folder within Dropbox. 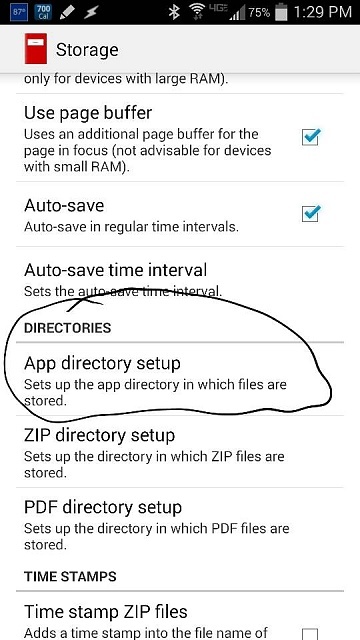 One can create a folder specific to the Note Pro on their Dropbox account and sync the My Documents folder on the device to this folder for example, and then work completely "locally" on the device while having Dropsync keep files synchronized with the cloud. I haven't set this up yet but am considering it. This is excellent information. I tried it out and, while not perfect, it does address all of my issues on some level. I read a few negative comments about Dropsync, but it is working for me. I may move files out of the synced folder periodically to avoid some of the issues others claim to have with lost files. Thanks so much! Another paid app that is great and works with Dropbox is Dropsync. I love it and it is great! I have a free 50g for life with Box and I use FolderSync. It will sync any folder with any number of cloud services and it seems to work pretty well. I have it set up to sync when it detects a change to the folder. Scheduled syncs are also availble. It has a lite version but I went ahead and purchased the paid version. Actually FolderSync is set once and forget. You set up your "Folder Pairs" and how you want them synced, one way or two way and how often either by schedule or instant. You can select the remote folder be it an SD card in your tablet or one of the Cloud accounts you configure. If, for instance, you wanted your "My Documents" folder to sync to both Box and Dropbox upon change detection you would create two folder pairs. One between the tablet and Box and one between the tablet and Dropbox. You can also configure whether you sync while of mobile data or only while on Wifi. There are lots of configuration options to suite your needs. For Notes I use Google Keep which Syncs to Google Drive automatically. Since Box.net doesn't have a native sync for Android this works perfectly for me. I need to sync more than just my notes, I do a lot of Microsoft Office work and I'm on the road every week so I need to have access to the documents everywhere. Figured out how to use SD card but still can't find how to choose a cloud as my destination.. how would it know? It's under "Accounts". May be a paid feature, dont remember if it was in the Lite version. How do you even get to accounts unless you meant the directory accounts? If only it was smart enough to sync only files that have recently been altered, that would save so much time. If the app could check which device has the latest alteration and use it as the main copy..... I'd certainly pay for an app like that. Grimgak. Nope. Box and Dropbox (I think) will sync to your laptop. Then use Foldersync for Box to sync your tablet with Box. I am not sure about the suyncing capabilities of Dropbox. Both services should give you enough free space to store homework. Of course you can do the same thing with Google Drive and not pay a cent. I meant i'd pay for the time saving of syncing only the newly altered files not the storage so google drive wouldn't make any difference. So when Foldersync sees a file changed it syncs that file. I'd assume that you will only be working on one device at a time so presumably the file that is changing is the latest. That should get migrated to your storage and to your laptop....at least Box and foldersync work that way. @Grimgrak I use the paid for version of Dropsync and it only updates the files that have changed. On Lecturenotes (LN) , I have setup a folder on my Note, I setup a folder named Lecturenoteshare and in settings in LN, in the storage location, I set that folder for my LN which is the third option down. Now on my phone, I have the same setup. I then backup my notebook board which will be saved to that folder. I use dropsync to select the LectureNotesShare from my tablet and the same folder in my Dropbox. Now on my phone I set up LN the same way and the first time I open LN on my phone, I choose to restore the notebooks board and everything matches my tablet and my phone. It took me a little while to figure out how to do it that way, but now it only takes a few minutes and I can use my LN on my phone or tab. Why wont it just let me browse to find the sd card and makes me type in a specific directory without me being able to see where that actually is? Now how do I tell lecturenotes to go there to reference my notebooks board as it is now currently blank! 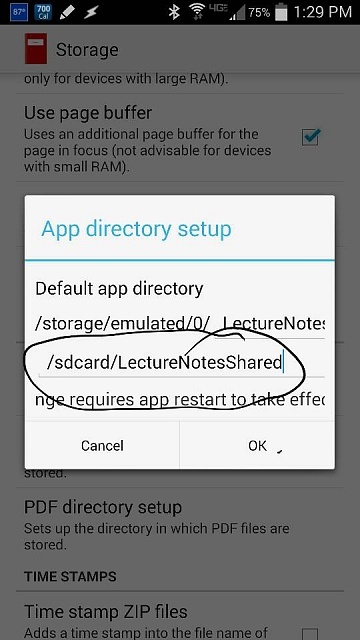 Lecturenotes has not been updated to work with Kitkat yet and cannot right to the SD card. So it has to save to internal memory. 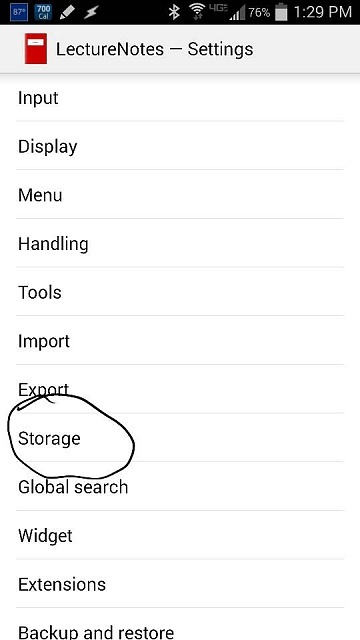 To change the storage location in LN, it is in settings under storage and then choose custom and put in the path where you would like the files stored. You have to manually type in the path. You need to backup your notebooks board and then copy it to the new directory along with all files in the original directory. Once changed to new directory, then choose restore notebooks board. Once I restore it from the location of the ext storage card I will still have the problem of .... anything I add to lecturenotes be it a scribble of a new pdf will not be able to be written onto my external memory which doesn't help me free up space Am I correct? Or will it be able to save onto the card. Ironically as I am using my laptop to force the zip file to be transfered I now cannot access LN on my tablet because it thinks it's on the SD card LOL..... face palm. I use ES File Explorer which has been updated to work with Kitkat. I have been using ES for a while on kitkat to copy and delete without a problem. Yes you are correct about not being able to write to the SD card from LN. I emailed the developers to ask when they would be updating the app to work with Kitkat. Kitkat is more secure with respect to how it allows apps to interact with the file system and as a result most apps have to be updated in order to write to the SD card. Several have been updated already and work fine, but LN is one that has yet to be updated. It happened on my note 3 as well when it updated to Kitkat last week. I opened a file from LN and it popped up a warning about not being able to write to the SD card. Hopefully if enough people contact the developers, they will get on the ball and fix it. many thanks for your email, I am sorry to hear about the problem. release is scheduled for end of May. Ouch guess i'll wait. In the mean time it says that I have 15g in docs... I find that hard to believe. Is there an easy way to see where those 15g's are located so I can figure out if it's from multiple backups of LN or some duplication to free up some space? Is there a way to restore text messages on my phone? What's going to happen to the Internet?